But to those who did accept him he gave power to become children of God, to those who believe in his name, who were born not by natural generation nor by human choice nor by a man’s decision but of God. And the Word became flesh and made his dwelling among us, and we saw his glory, the glory as of the Father’s only Son, full of grace and truth. John testified to him and cried out, saying, “This was he of whom I said, ‘The one who is coming after me ranks ahead of me because he existed before me.’” From his fullness we have all received, grace in place of grace, because while the law was given through Moses, grace and truth came through Jesus Christ. No one has ever seen God. The only Son, God, who is at the Father’s side, has revealed him. Reflection on the gospel reading: The Prologue from the Gospel of John seems to be a hymn of the Johannine community that members of that community sang as part of their worship. There is strong evidence that John’s gospel enjoyed the benefit of one or more editors, and that an editor took the hymn and added it to the start of the gospel. In any event, what can we make of this hymn and, indeed, the testimony of the other gospels except that people who were very near Jesus in history, who enjoyed the testimony of people who had walked with Jesus, had a very high opinion of him? We are used to conciliar statements about Jesus’ nature, statements removed by centuries from the Lord’s life in Palestine and made dubious in the minds of skeptics because of their remoteness in time from the flesh and blood Jesus, but here at the start of John’s gospel, there are some extraordinary claims made about who Jesus is. These claims relate closely to an experience of him by people who saw him, heard him, touched him, knew him. Added to this testimony the willingness of many of those who saw, heard, touched, and knew him to go to their deaths for what they had seen and what they had heard, claims such as those which we have in the Prologue seem to me to be very powerful indeed. We close another year fully conscious that God has blessed us but also aware that human nature always admits of failure. We trust God to wipe away every tear and make all things new again. Joy to each of you in the new year 2012. May we all love the Word, the man Jesus, who is our divine Lord, still more dearly next year on this day than we do this year on this day. That journey into the love of Jesus begins right here, right now. Praised be Jesus Christ! Saint of the day: Saint John Francis Regis, S.J. was born January 31, 1597. He was born in Fontcouverte, Aude, Languedoc, France. His father, Jean Regis, had recently been ennobled as a result of service rendered during the Wars of the League. His mother, Marguerite de Cugunhan, was of a noble family. He was educated at the Jesuit College of Beziers. At the age of eighteen, Regis considered a conversion to Buddhism. In his nineteenth year, however, he reassessed his situation and entered the Jesuit novitiate at Toulouse on December 8, 1616; he took his vows two years later. After finishing his course in rhetoric at Cahors, John Francis was sent to teach grammar at several colleges: Billom (1619-1622), Puy-en-Velay (1625-1627), and Auch (1627-1628). While he was teaching, he also pursued his studies in philosophy at the scholasticate at Tournon. 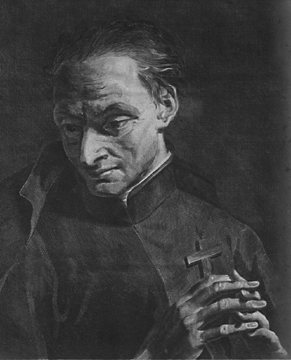 Owing to an intense love of preaching and teaching the Faith, as well as the desire to save souls, Regis began his study of theology at Toulouse in 1628. Less than two years later, in 1630, he was ordained a priest at the age of thirty-one. The following year, having completed his studies, Regis made his Third Probation. Regis was now fully prepared for his lifework and entered upon his apostolic career in the summer of 1631. As a newly ordained priest, he worked with bubonic plague victims in Toulouse. From May, 1632, until September, 1634, his headquarters was at the Jesuit College of Montpellier. Here he labored for the conversion of the Huguenots, visited hospitals, assisted the needy, withdrew from vice wayward women and girls, and preached Catholic doctrine with tireless zeal to children and the poor. Regis established the Confraternities of the Blessed Sacrament, which organized charitable collections of money and food from the wealthy. He also established several hostels for prostitutes, and set up girls as lacemakers to give them an income. In 1633, Regis went to the Diocese of Viviers at the invitation of the local bishop, Monsignor Louis II de la Baume de Suze, giving missions throughout the diocese. From 1633 to 1640 he evangelized more than fifty districts in le Vivarais, le Forez, and le Velay. Regis labored diligently on behalf of both priests and laymen. His preaching style was said to have been simple and direct. He appealed to the uneducated peasantry and numerous conversions resulted. Regis longed to devote himself to ministry to the indigenous people of Canada, but he remained in France all his life. His hardships were so incredible as he endured all for his apostolic journeys over rugged mountains in the depths of winter. 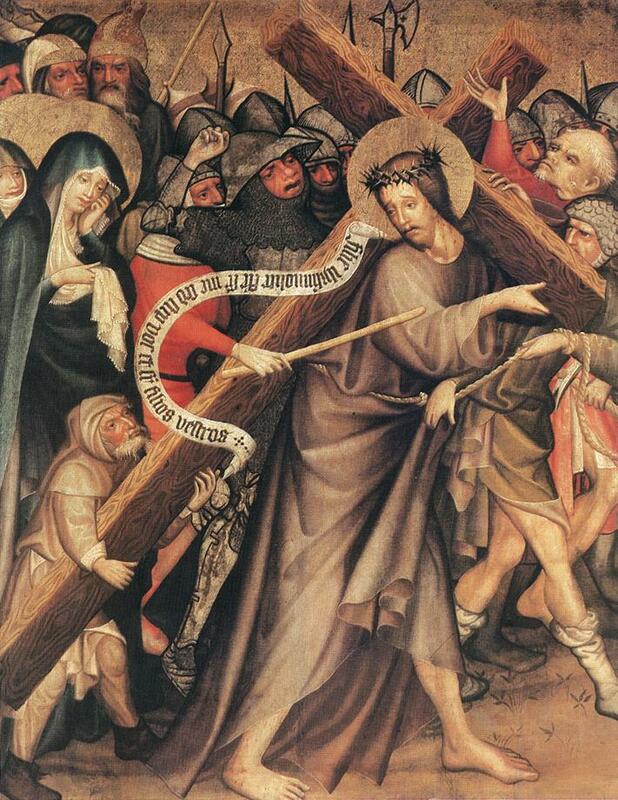 He would not allow anything to stand in his way in the salvation of souls. John Francis had succumbed to illness during the winter of 1640, while he was contemplating the conversion of the Cévennes. He died of pneumonia on December 30, 1640, at Lalouvesc (now in the Department of Ardèche), Dauphine, France. 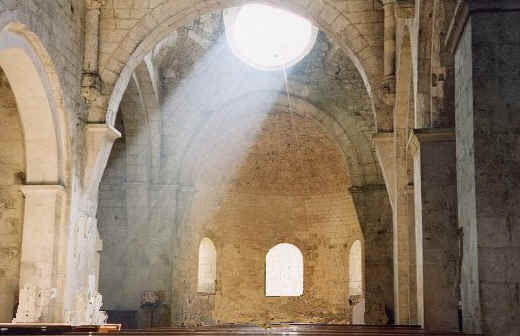 In a National Catholic Reporter article from May 25, 2010, printed an article about 10 major faith and church struggles for our age as developed by OMI priest, Ron Rolheiser. As we begin 2012 it might be worth our while to ponder these points. 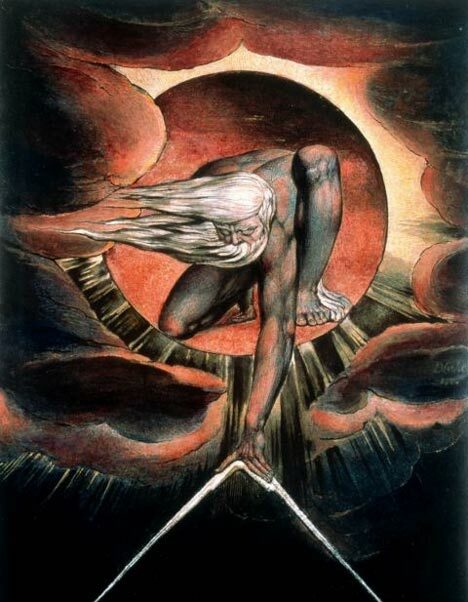 A struggle with the atheism of our everyday consciousness in a world caught up with materialism. 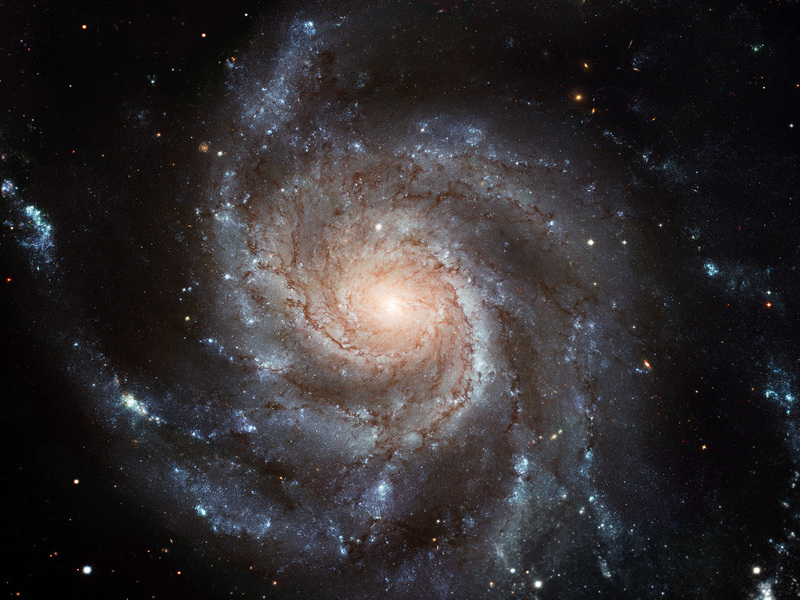 This is a very strong narcotic that places us at the center of our universe rather than God. So, how do we combat the atheism of our everyday consciousness? It requires us to be purposely mindful of all we have and not fall into the trap of seeing ourselves as the center of our universe. A struggle to live in torn, divided and highly polarized communities to become healers and peacemakers even though we are wounded ourselves. How do we become healers and peace makers when we too are wounded in a divided world? In the Prayer of St Francis he asks God to help him sow unity when there is division first by seeing the whole cloth of creation as one and envisioning us being part of the process where the torn edges are joined together by finding a common thread of hope to bind all. 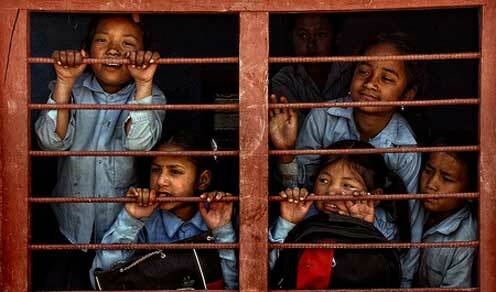 A struggle to live, love and forgive beyond the infectious ideologies we daily breathe. We need to be neither liberal nor conservative but rather a people of true compassion. Going beyond ideologies is a difficult challenge for they tend to define who we are. We find those of opposing positions as detrimental to a process of forgiveness. Yet we are asked to be compassionate, to walk a mile in the shoes of the other to begin to understand others and treat them as we wish to be treated. A struggle for a healthy sexuality that is both chaste and passionate. A healthy sexuality in a society that on one hand glorifies rampant sexuality or denigrate the sexuality of individuals through ostracism, mutilation and death demands we stand for justice. None are slaves to the sexual desires of others nor should they become victims of brutal misogyny. A struggle for interiority and prayer in a culture that promotes a virtual conspiracy against depth and serenity. We as a society have also become afraid of silence. We play music through buildings, headphones, telephones and computers to insulate ourselves from those around us and in doing so deafen ourselves to what God may be telling us. Begin today taking even five minutes to just sit in a quiet place and do nothing more than breathe and relax It’s harder than you think for our first concern is controlling the time we spend, then concerning ourselves with what needs to be done after this time is finished thus creating a cacophony in our minds. If nothing else simply allow yourself to be bathed in the silence of the moment, to be bathed in the simple knowledge that you are loved just the way you are even with all the distractions your mind creates. A struggle to cope with personal grandiosity, ambition and pathological restlessness in a culture which nurtures immediate and ongoing gratification. We also find ourselves in a society that creates expectations for personal success regardless of the cost to ourselves and others. We are no better than our next sale, next take over, the next whatever. We demand cheaper goods and services regardless of the cost to human lives in our country or other nations so we can become sated. We find, however, that we are never sated and we bemoan the fact that we have become a debtor nation on the backs of the poor. Let us explore our hunger for more and demand justice for others in how we comport ourselves. A struggle to not be motivated by paranoia, fear, narrowness and over protectionism in the face of terrorism and overpowering complexity, to not let the need for clarity and security trump compassion and truth. This struggle is a result of our need to control what we think is ours. Look at the birds of the air, the lilies of the fields, Jesus told us, your Father is always mindful of them. Then he takes an even broader step by telling is to share what we have with generosity. By doing that we can begin to escape a rampant paranoia that we won’t have enough for we will encourage the generosity of others. Yes, the problems are complex but it is better to feed the hungry, clothe the naked, heal the sick and injured with compassion and thus built trust in a world that only sees war. A struggle with moral loneliness inside a religious, cultural, political and moral dispersed society; to find a soul mate who is there with us at our deepest level. Is there anyone out there who believes, feels and wants to make change happen? Are the rules of religion, culture, politics such that we turned off and dissuaded from finding others with whom we can share our lives? A struggle to link faith to justice, ecology and gender and to get a letter of reference from the poor. Like all of the struggles noted before, we must find ways to balance all by not placing ourselves as the center of the world. Justice can happen when we are willing to make a commitment to it. Our world ecology will not wither if we are willing to take steps to change our expectations and curb our demands on its bounty. Gender will cease to be a barrier when we value each individual as God’s special creation. Trappist monk Fr Louis, aka Thomas Merton, had a mystical experience on the streets of Nashville on the rare visit he made to his physician’s office. Standing there on a street corner he saw all around him radiating a brilliance that could only be God’s presence hidden in their lives. He mused that if everyone could have seen this there would be no more wars, hatred or fear yet there would also be an unhealthy desire to bow in worship to one another and not the God who is present among us. A struggle for community and church to find the healthy line between individuality and community, spirituality and religiosity, to be both mature and committed, spiritual and church to one another. Western culture has focused on the importance of the individual to the exclusion of the importance of the community. When faced with a tribal culture, western concepts of individuality could not and cannot grasp what this means in the lives of billions in the world. We need to learn to listen more to one another and see ourselves not as loners but part of a whole where the good of the individual is as important as the good of the whole community, where there is a synergy that must happen if we are to grow as God’s people. As we progress in 2012 it might be good to keep these points in mind to determine how we as individuals can start to make a difference not just in our own lives but in the lives of those around us thereby beginning a change in the way the world operates. Impossible? I remember a song that was popular some years ago called High Hopes. It was about how the impossible can happen. An ant was toppling rubber tree plants that were massive in comparison to its diminutive size and a ram was butting a huge power dam to create a hole. Each was successful despite the enormity of the challenge. Emmanuel, God is with us, is what we need to be successful too for we have High Hopes that his kingdom will come because we are willing to struggle with the hard questions. There was a prophetess, Anna, the daughter of Phanuel, of the tribe of Asher. She was advanced in years, having lived seven years with her husband after her marriage, and then as a widow until she was eighty-four. She never left the temple, but worshiped night and day with fasting and prayer. And coming forward at that very time, she gave thanks to God and spoke about the child to all who were awaiting the redemption of Jerusalem. 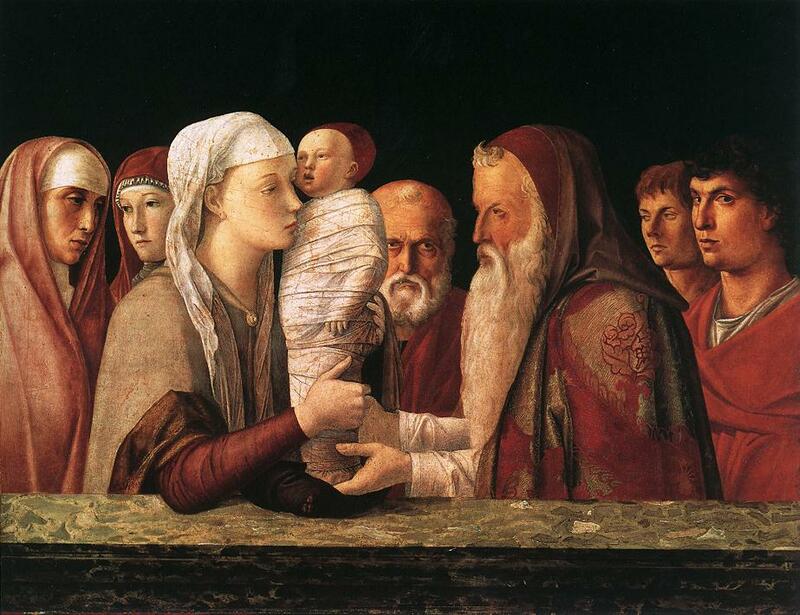 Reflection on the gospel: Anna’s presence in the story about Mary, Joseph, and Jesus’ encounter with Simeon doesn’t add any specific themes to the narrative. After all, Anna does what Simeon does, that is, prophesies about the child. Luke, however, in his gospel makes a point of the role of women in the unfolding of Jesus’ story, and whenever he introduces a man, he introduces a woman as a counterpoint. Anna serves this role in the gospel: to make sure we understand that God works through women just as God works through men. There also is an interesting conclusion to this narrative: Jesus commences his first hidden life. We see it punctuated when the young Jesus speaks with the elders at the Temple in Jerusalem before he begins his longer hidden life. All we know about his first 12 years is that he grows, becomes strong, is filled with wisdom, and God favors him. It might seem there is no moral in this account for us, but we too live lives that are hidden, and God calls us, like God called Jesus, to grow, become strong, be filled with wisdom, and be favored. 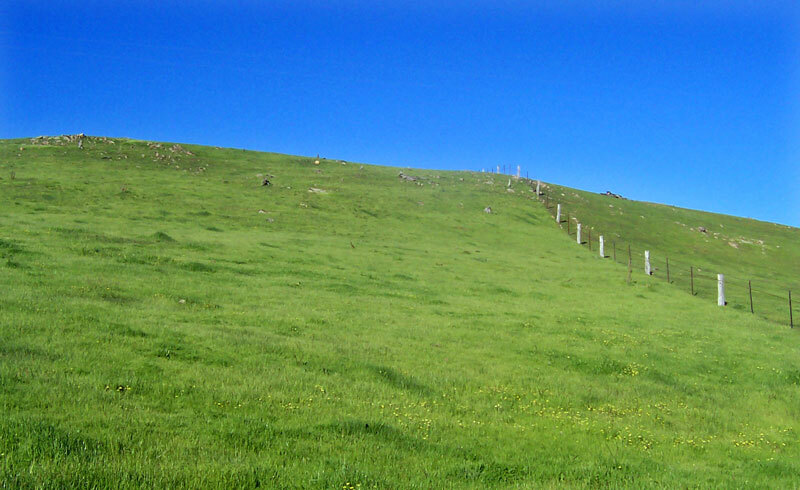 The project, when we consider the expanse of our lives, may sound daunting, but surely we can do it just for today. Saint of the day: Born of royal blood in the 7th century, Egwin entered a Benedictine monastery and was enthusiastically received by royalty, clergy and the people as the bishop of Worcester, England. As a bishop he was known as a protector of orphans and the widowed and a fair judge. Who could argue with that? Upon his return to England, he founded Evesham Abbey, which became one of the great Benedictine houses of medieval England. It was dedicated to Mary, who had reportedly made it known to Egwin just where a church should be built in her honor. He died at the abbey on December 30, in the year 717. Following his burial many miracles were attributed to him: The blind could see, the deaf could hear, the sick were healed. Reflection on the gospel: Among the four writers of the gospels, Luke was the most skilled stylist. A Gentile Christian, he immersed himself in the traditions of the Hebrew scriptures and possessed an intimate knowledge of the Septuagint, the Greek rendering of the books that came to be known among Christians as the Old Testament. Luke’s infancy narrative has an interesting stylistic overlay full of meaning. In the chapters devoted to the coming of Jesus, Luke writes in the style of the Septuagint and shifts dramatically to a more contemporary style when he opens his account of Jesus’ ministry. 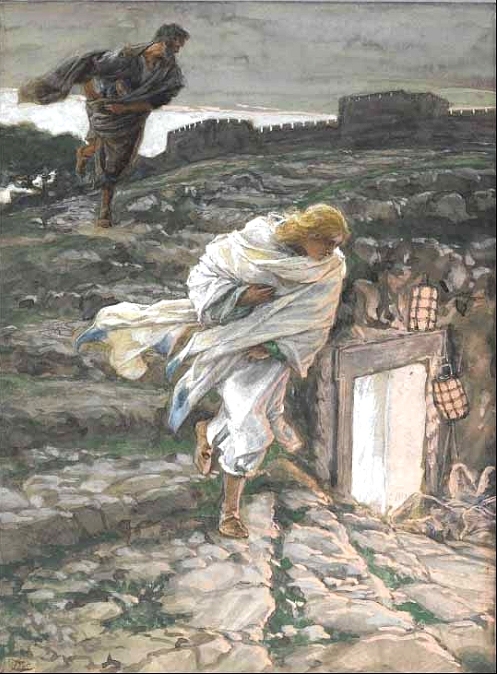 By doing this, Luke sought to connect Jesus’ coming to the fulfillment of the ancient promises. 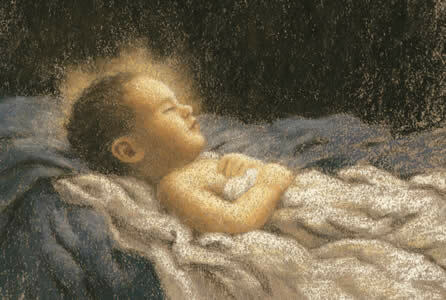 Simeon’s story from today’s gospel is rooted deeply in Luke approach to his infancy narrative. 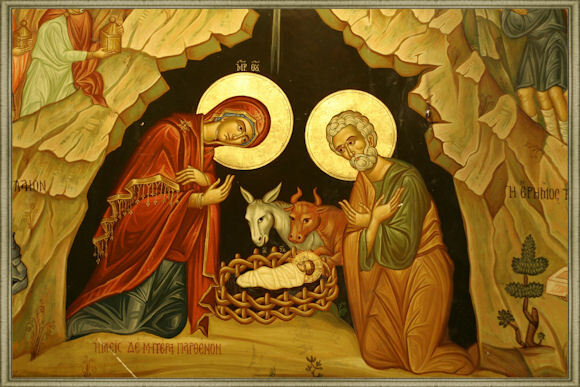 Simeon serves as the paradigm of an Old Testament prophet who can look into an apparently ordinary baby from a poor family and recognize the Christ for whom he has waited his entire life. 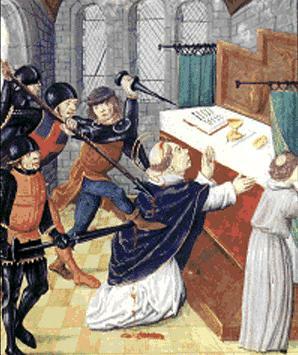 Saint of the day: Thomas à Becket was born in London, England in 1118. The son of Gilbert à Becket, an English merchant and the onetime sheriff of London, Thomas was of Norman ancestry. Educated at Merton Priory, Paris, Bologna, and Auxerre, Thomas was a civil and canon lawyer. He served as both a soldier and an officer. He became the Archdeacon of Canterbury because of his skills in administration. A friend of King Henry II, he became the Chancellor of England. When the Archbishop of Canterbury died, the King eventually chose his friend to succeed him; Thomas was ordained a priest one day, bishop the next, and later the afternoon of his episcopal ordination, he became Archbishop of Canterbury. To the King’s surprise and consternation, Thomas opposed the King’s interference in ecclesiastical matters. As a result, he went into exile several times. On December 29, 1170 in the Cathedral at Canterbury, England, he was murdered by the King’s knights, who believed they were acting at the King’s behest. Thomas was canonized three short years later in 1173. Henry came to the Cathedral in July of the next year to do public penance for Thomas’s death. When Herod realized that he had been deceived by the magi, he became furious. He ordered the massacre of all the boys in Bethlehem and its vicinity two years old and under, in accordance with the time he had ascertained from the magi. Then was fulfilled what had been said through Jeremiah the prophet: A voice was heard in Ramah, sobbing and loud lamentation; Rachel weeping for her children, and she would not be consoled, since they were no more. 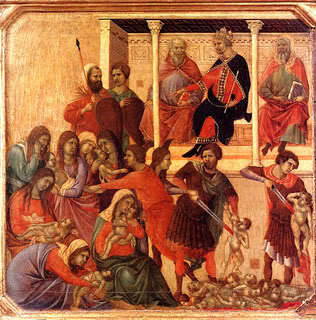 Reflection on the gospel reading: The Church calls the Holy Innocents “martyrs.” “Martyr” in the Greek means witness. We Christians typically use the term “martyr” to refer to someone who prefers death to denying Christ; in other words, martyrdom involves an act of self-conscious integrity that embraces death rather than violate one’s relationship with Jesus. The Holy Innocents weren’t baptized, and they didn’t even know who Jesus is. They were hapless victims of circumstances that made them the wrong kind of people at the wrong place at the wrong time. 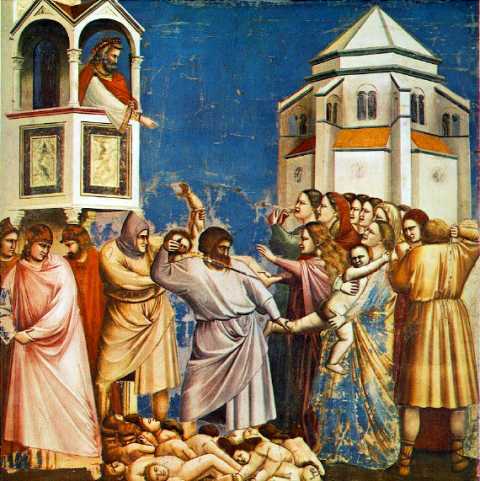 What kind of martyrs then are the Holy Innocents? They are like so many other children born into war, famine, abuse, and disease. They witness to us like a mirror. They do nothing worthy of punishment, yet they show us by their violation despite their perfect innocence exactly what malevolence we are capable of. In this, they are martyrs, if not by their conscious being then by their very existence. All of these children, Herod’s innocents, children victimized by war, hunger, HIV, and other diseases, call on the consciences of humanity to stop our madness and give ourselves to the Lord of Light. Saint of the day: Herod “the Great,” king of Judea, was unpopular with his people because of his connections with the Romans and his religious indifference. Hence he was insecure and fearful of any threat to his throne. He was a master politician and a tyrant capable of extreme brutality. He killed his wife, his brother and his sister’s two husbands, to name only a few. Herod became furious and “ordered the massacre of all the boys in Bethlehem and its vicinity two years old and under.” The horror of the massacre and the devastation of the mothers and fathers led Matthew to quote Jeremiah: “A voice was heard in Ramah,/sobbing and loud lamentation;/Rachel weeping for her children…” (Matthew 2:18). Rachel was the wife of Jacob/Israel. She is pictured as weeping at the place where the Israelites were herded together by the conquering Assyrians for their march into captivity. Reflection on the gospel: Early liturgical commentaries associate the Feast of John as closest among the feasts of the apostles to Christmas because of the belief that John, as the Beloved Disciple, enjoyed a special friendship with the Lord. In fact, John’s gospel claims the Beloved Disciple stood at the foot of the cross, the only male disciple to not abandon the Lord in his darkest hour. The gospel of the day is taken from John’s gospel and testifies to Peter and John’s excited run to tomb of Jesus after Mary of Magdala announces to the disciples that the Lord’s body is not in the tomb. The small details in this account truly do seem to suggest a firsthand account: Peter and the Beloved Disciple running, the younger man arriving first but waiting, perhaps deferentially, for the older man to go on in first, a commentary on the positions of the burial cloths, but perhaps most importantly, the reaction of the Beloved Disciple to what he saw: “He saw and believed.” John’s reaction to what he perceives is belief in what he has yet to perceive: the living resurrected Lord. In three days, we have remembered the birth of the Lord, recalled he experienced suffering from the start of his life, and recollected his resurrection in the witness of the Beloved Disciple to what he saw. 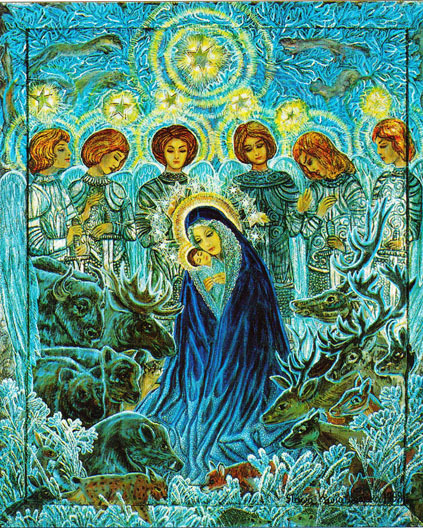 We cannot celebrate Christmas without remembering the reason the little Babe came to us, that is, to suffer, die, and rise. 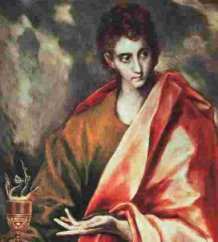 Saint of the day: John the Apostle was the son of Zebedee and Salome. A fisherman, he was the brother of the Apostle James and called one of the Sons of Thunder. A disciple of John the Baptist and a friend of Peter the Apostle, John was called by Jesus during the first year of his ministry, and traveled everywhere with him, becoming so close as to be thought by many to be the mysterious beloved disciple of the Gospel of John. He took part in the Last Supper. The Beloved Disciple was the only one of Jesus’ followers not to forsake the Savior in the hour of his Passion. He stood at the foot of the cross. 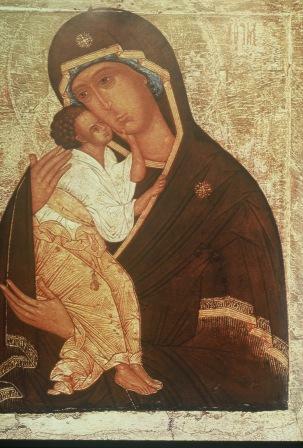 Jesus made him the guardian of Our Lady. Upon hearing of the Resurrection, the Beloved Disciple was the first to reach the tomb; when he met the risen Lord at the lake of Tiberias, he was the first to recognize Him. In keeping that the Beloved Disciple and the Apostle John were the same person, the Church has placed John’s feast near the birth of the Lord to emphasize the ties between the birth of the Lord and his ultimate passion, death, and resurrection. Reflection on the gospel reading: The Church is at pains in this week following Christmas to remind us that the child whose birth we celebrated yesterday comes with a purpose. We may imagine that the Prince of Peace has come to end divisions, and this is true. But along the way, he will be the source of many divisions. 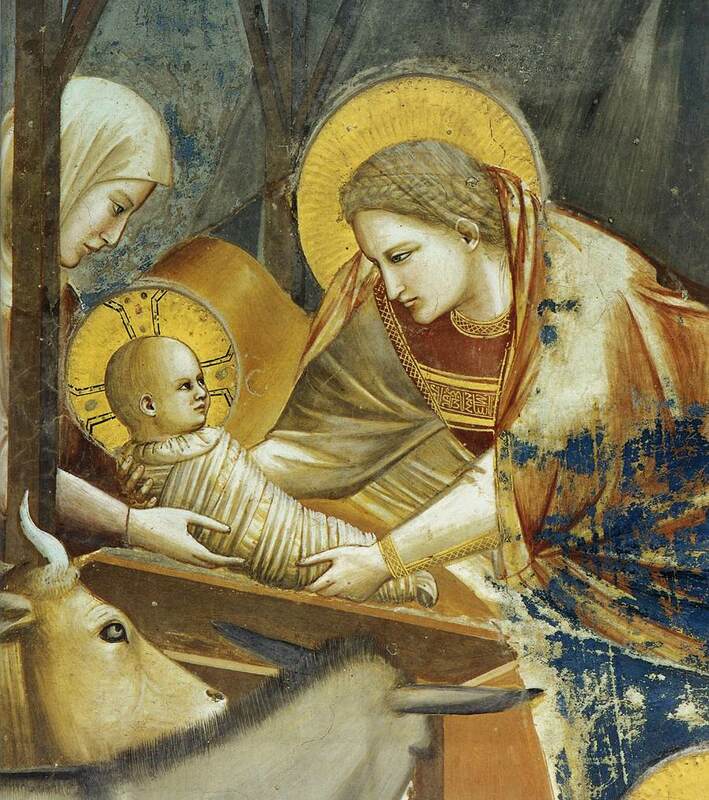 Let us remember in the Christmastide that the sentimental imagery of the Bright Babe is an isolated part of a much bigger and very rough story that includes suffering and death alongside incarnation and resurrection. Acts says that Stephen was a man filled with grace and power, who worked great wonders among the people. Certain Jews, members of the Synagogue of Roman Freedmen, debated with Stephen but proved no match for the wisdom and spirit with which he spoke. They persuaded others to make the charge of blasphemy against him. He was seized and carried before the Sanhedrin. In his speech, Stephen recalled God’s guidance through Israel’s history, as well as Israel’s idolatry and disobedience. He then claimed that his persecutors were showing this same spirit. “[Y]ou always oppose the holy Spirit; you are just like your ancestors” (Acts 7:51b). His speech brought anger from the crowd. 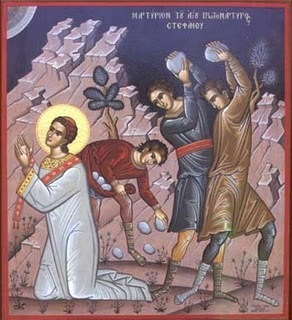 “But [Stephen], filled with the holy Spirit, looked up intently to heaven and saw the glory of God and Jesus standing at the right hand of God, and he said, ‘Behold, I see the heavens opened and the Son of Man standing at the right hand of God….’ They threw him out of the city, and began to stone him….As they were stoning Stephen, he called out, ‘Lord Jesus, receive my spirit….Lord, do not hold this sin against them’” (Acts 7:55-56, 58a, 59, 60b). Above thy deep and dreamless sleep, the silent stars go by. The words had always touched him; every year they still brought back Christmas to him, for some reason, as nothing else could. Now they seemed to him as beautiful as any poetry he had ever known. He said them over to himself very slowly and calmly: just a statement. . . . The silent stars go by, he said aloud, not whispering, but so quietly he was sure they could not hear. His eyes sprang full of tears; his throat, his chest knotted into a deep sob which he subdued, and the tears itched on his cheeks. Yet in thy dark streets shineth, he sang loudly, almost in fury, within himself: the everlasting light! and upon these words a sob leapt up through him which he could not subdue but could only hope to conceal. . . . The hopes and fears, a calm and implacable voice continued within him; he spoke quietly: Of all the years. Are met in thee tonight, he whispered: and in the middle of a wide plain, the middle of the dark and silent city, slabbed beneath shadowless light, he saw the dead man, and struck his thigh with his fists with all his strength. The scene in the novel, like the gospel narrative of the Christmas events, joins together the imminent and transcendent aspects of living. The celebration of the birth of Jesus anticipates the end of his life on the cross, and the Church’s commemoration of his birth recalls to the minds of believers the aim of Jesus’ life lies in his death and resurrection. As Andrew, his heart full of pain for the loss of his brother-in-law, accompanies his parents home, he remembers a hymn that places singers at the scene of the Savior’s birth in their imaginations. A still night, the solicitude of members of a family for one another, the gnawing raw presence of death, and the Christmas narrative knit together in Andrew the solitary, sinful, broken, and fragile lives that the birth of the Christ child encapsulates in all its anticipated grief. A Death in the Family, in this passage, points to the element in the Christmas story that includes the fragility of human existence. As we enter into the mystery of the Word made flesh, let us not forget this day of days that the Baby who comes, comes with a purpose. Reflection on the gospel reading: The passage that we read today is Zechariah’s canticle. 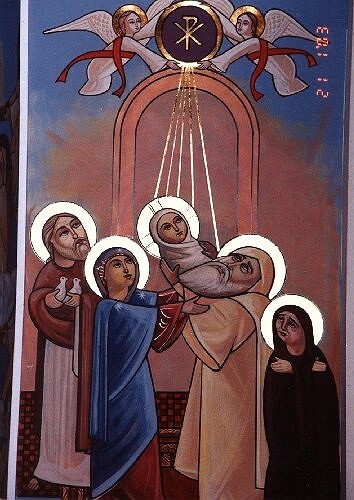 Luke reports that John the Baptist’s father regained his speech after he consented to the angel’s request that the baby would be called “John.” When he regained his speech, he broke into a song of praise for the birth not just of his own son, the one to go before the Lord to prepare his way, but also for the long-awaited messiah, a mighty Savior, born of the house of his servant David. May joy and peace be to each of you and all of us. 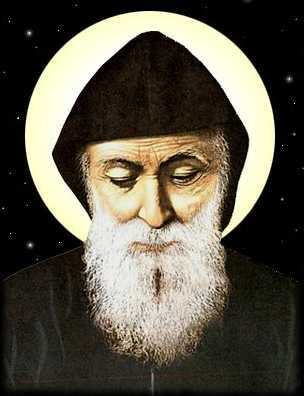 Saint of the day: Saint Charbel Makhluf was born on May 8, 1828, in Lebanon, he was the son of a mule driver. He was raised by an uncle who opposed the boy’s youthful piety. The boy’s favorite book was Thomas a Kempis’s The Imitation of Christ. At age 23, he snuck away to join the Maronite monastery where he took the name Charbel in memory of a second century martyr. He professed his solemn vows in 1853 and became a priest in 1859. He lived as a model monk but dreamed of living like the ancient desert fathers. A hermit from 1875 until his death 23 years later, he existed on the barest essentials of everything. He gained a reputation for holiness and was much sought for counsel and blessing. He had a great personal devotion to the Blessed Sacrament. He celebrated Mass at noon so he could spend the morning in preparation and the rest of the day in thanksgiving. We live in an increasingly cynical world. We find we can’t trust what we read or hear from others. Grasping for some sense of order and stability we romanticize about simpler times and fall into the belief that rigid interpretation of the law or belief systems will give us what we need to set things right again. Political groups such as the Tea Party and religious groups such as fundamentalist, evangelical Christians appeal to us because they seem to offer simple answers to complex problems. Others have yielded to hopelessness believing that the end of the world is near as they look at the economic crisis, natural disasters and riots in the streets. Is the end of the world truly coming because the Aztec calendar ends in 2012? Because of this lack of trust we have become increasingly estranged from one another and from what God wants of us. Yet, we can suspend our preconceived notions for a little while when books or films capture our imagination. Such classics as “The Lord of the Rings,” “The Chronicles of Narnia,” the “Star War” epics and even “It’s a Wonderful Life” appeal to something deep within each of us in our search for truth and goodness at work in a cynical and dangerous world. We see part of who we are and who we want to be in the truth and beauty of these tales. The Christmas story is just like that, touching at the core of who we are in relationship with God. We want miracles like that happen to us today. Part of the appeal of these kinds of stories is that they all relate to humble origins and crises which propel the individual into taking some action that is contrary to what the world believes. The story itself probes into our hearts in such a way that we see beauty and truth in the commonness of life as well as the heroic things in life. These stories share a common element, love. This love comes from a well spring that exists inside the heart of each of us and echoes like a tuning fork resonating in pitch with the truth and beauty within the story. In our Christmas story we have the ultimate result of this longing for love when God chooses to enter into human history becoming one like us in all things except sin. Through the incarnation God becomes one with us God sharing in our humanity, in all its cynicism, fear, ugliness and death, transforming them into hope, love, beauty and eternal life. Yes, we want to believe in the story but it seems so unbelievable. 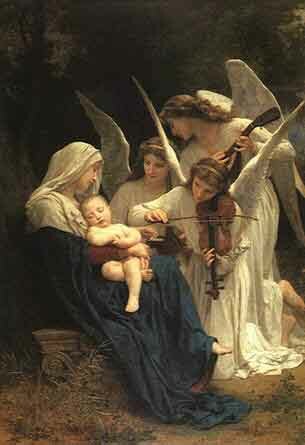 Like little Mary we find it hard to believe that God would act in our lives in such a mundane way. Why would God want to become like us, our life is hard? It is often filled with pain, hatred, fear and death. It is also filled with love, hope and an abiding faith that things can be better. God chose to be with us because he loves us unconditionally, creatures made of star dust over billions of years. By becoming Emanuel (God with us) he also raises us to share in his divinity. His challenge to us is to learn how to love as God the Trinity loves, unconditionally from the mundane to the heroic. A recent article discussed 50 economic numbers that are hard to believe. Among the items were the facts that 48 percent of American live at or beneath the poverty level, that nearly 57 percent of all US children live at or beneath the poverty level, that 20 percent of employed workers are currently working jobs at the poverty level and that 40 percent of all jobs in the US are at the poverty level, that 1 in 6 elderly live below the poverty level, and that 1 of every 7 Americans and 1 of every 4 children are on food stamps. These are only US statistics those for the rest of the world even make America’s poor seem wealthy in comparison. The minimum amount of love due to each person is called justice. Although we live in a society that calls itself Christian we allow injustice to not only exist but to grow unchecked. 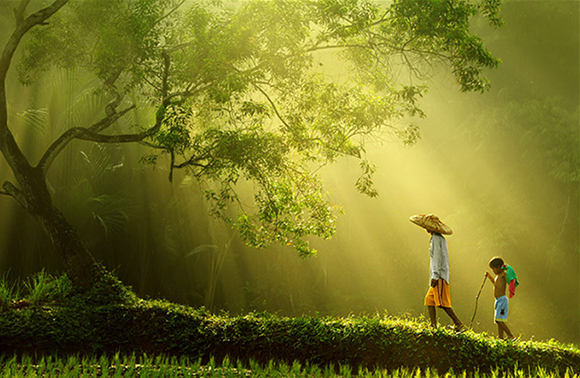 God entered into this world to as a sign of God’s abundance love for all his creation. His new command is that we love one another as he loves us. It is a love that has no conditions such as we tend to impose on others. I will love you if you follow the rules set down by society such as those relating to immigration or if you aren’t a prostitute, or if suffer from bipolar disease, AIDS or other condition. Jesus showed us God’s abundant and unconditional love by eating with the pariahs of “polite society,” the tax collectors, prostitutes, and lepers. He fed the hungry and directed his disciples to clothe those without clothing from their own abundance meager as it might be. Those who “get the message in the story” understand what they must do. God will make all things happen when we dare to follow him in love, hope and an abiding faith. No, disease, pain, hatred and death will not go away. They are part of the human condition yet because we contain a small part of the divine spark within us we can change things in our world. At a time when charitable giving has depressed with the economy we should make a special effort to forgo luxury items so that other may have the food, clothing and shelter to not only survive but to also begin to prosper. We need to look into our own hearts to identify those prejudices we have in our hearts that cause us to separate us from not only our fellow humans but from all of God’s creation and take steps to overcome them with thoughtfulness and action. Even within our own families we learn to not take each other for granted taking time to share meals together, dialogue about what is happening in our lives and offering support and love. When we can do these things we can begin to believe the unbelievable.